Customer service has been, and will continue to be, a central concern for most companies. Designing and delivering a positive customer experience relies heavily on the framework and capabilities of your call center or contact center, specifically the ability to support omnichannel interactions. 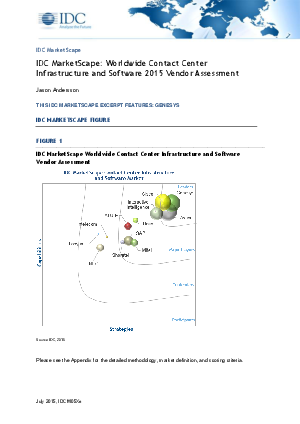 The IDC MarketScape examines 12 key players in the worldwide contact center infrastructure and software (CCIS) market, analyzing their current capabilities as well as longer term strategies that impact their ability to service customers and gain market share going forward.